It was the best item I have personally ever tested for [Ancestry]. I am really excited to see this new enhancement become available on their site. So look forward to exciting things from Ancestry. I can't tell you when it's coming. But from all the signs, I expect it soon. So start checking back often and expect to see it some time before Christmas. I love working at Ancestry. We do some really cool stuff, and we do it as quickly as we can. We mess up sometimes; don't hate us. Ancestry isn't the only one doing cool stuff. Two extremely significant developments have occurred recently. On his blog, Dan Lawyer of FamilySearch Labs demo'ed a simple mashup using the new FamilySearch API. 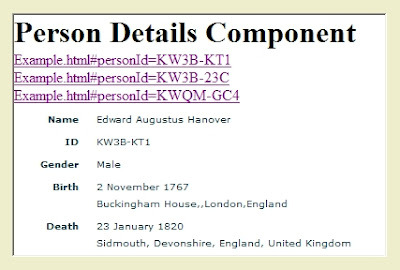 Click one of three links and the component makes an API call to New FamilySearch and displays details about the associated person. Imagine mixing and mashing components from multiple sources to create your own optimized web application. 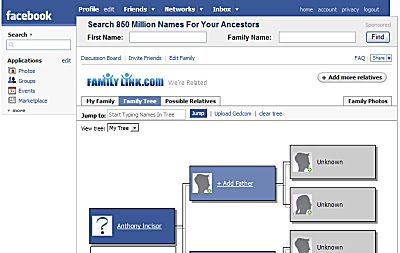 If the general public is allowed access to the FamilySearch APIs, this could be the most significant genealogical technology development of the year. WorldVitalRecords.com (WVR) released a Facebook application which appears to be their FamilyLink.com website packaged as a Facebook app. Properly architected, this is a powerful paradigm. Imagine a website being able to deploy as an application in multiple portals such as Facebook, Yahoo and Google. Enter your data once and leverage it across multiple universes for multiple purposes. This is another significant genealogical technology milestone. Ya' gotta love technology! Who can predict where all this will lead to!? !Stay tuned! Why waste eveyone's time telling us there's 'something in the works' without ANY information at all as to what it is? This isn't newsworthy, dude.